Not all of the class openers go off as intended. I suppose if they did, and I had a magic formula for engagement, then I’d be living on a dessert island by now with the money I’d made off bottling the secret. After a short quiz today, a lecture/exploration on operations on functions would begin. It’s not the most exciting lesson of the year, but there are some “ooh” and “aah” moments as students experience new functions. Domain and range also frame the discussion – and we finally move beyond “all real numbers”. Even though we were starting with a quiz, I wanted a visual to get students thinking about function behavior, and start to make some conjectures about addition and subtraction of functions. 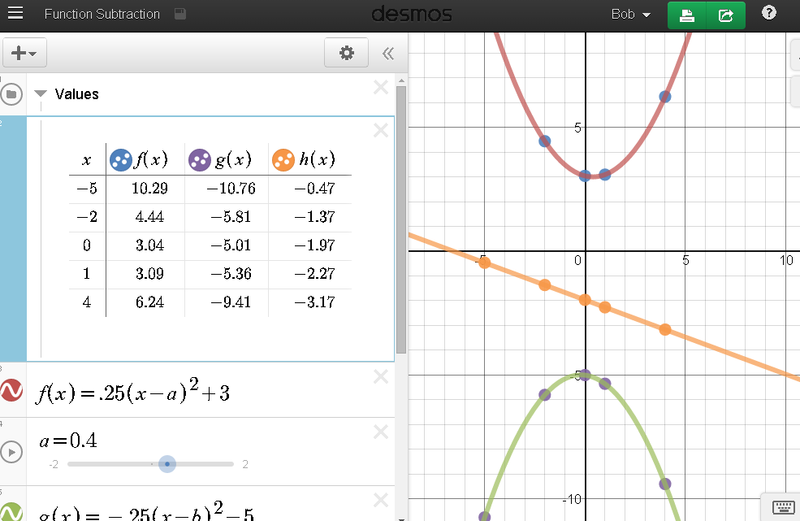 The Desmos graph here was animated and rolling as students entered. Click the graph to play on your own, and the animated gif below gives you a flavor the the motion. After the quiz, I hoped to generate discussion regarding the graph. What did the students notice? Any interesting patterns? How are the graphs related? Can we gain some insight by looking at a table of values? 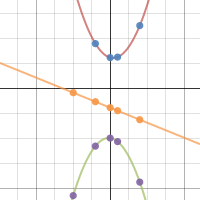 I was hoping students would eventually notice that the ornage function was the sum of the green and red, or at least note the “betweenness” of it all. But with the rush to get notes and discussion started, this opener ended up on the back burner. They’re not all winners….. All is not lost, though, as I’ll come back to this one tomorrow to build some connections between our notes and the homework.